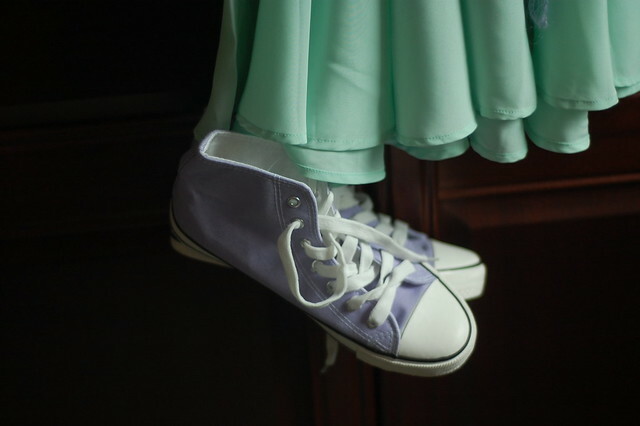 A pretty dress with casual shoes is my favourite combination, because a) it looks like I haven’t tried too hard and b) I feel readier for adventures involving running, climbing and bouncing. 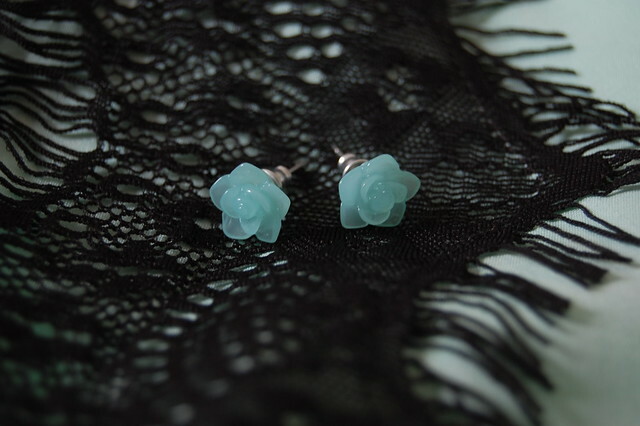 And it just so happens that I was gifted these tiny mint-green rose earrings. Perfect match! And here’s my classic LBD combination. This dress has a low back, so a light shawl is just the thing to take along in the evening. I think colour plays a big part in making your shawl look dressy or casual-chic. 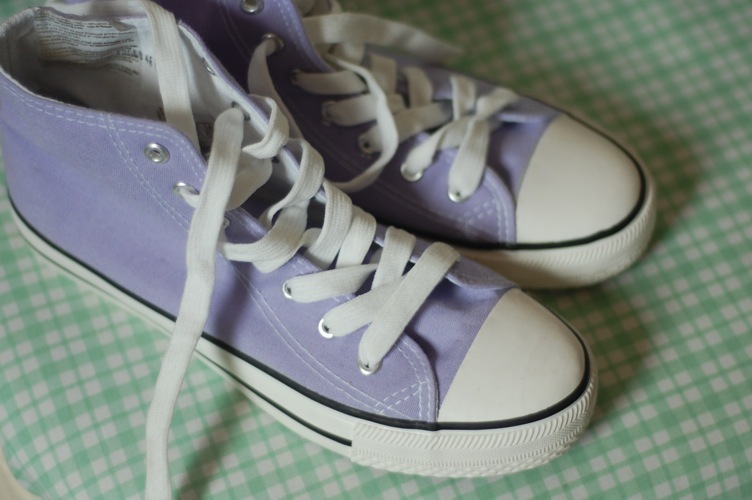 Lavender is a great colour because it complements most skin tones and hair colours, and it has an understated elegance. 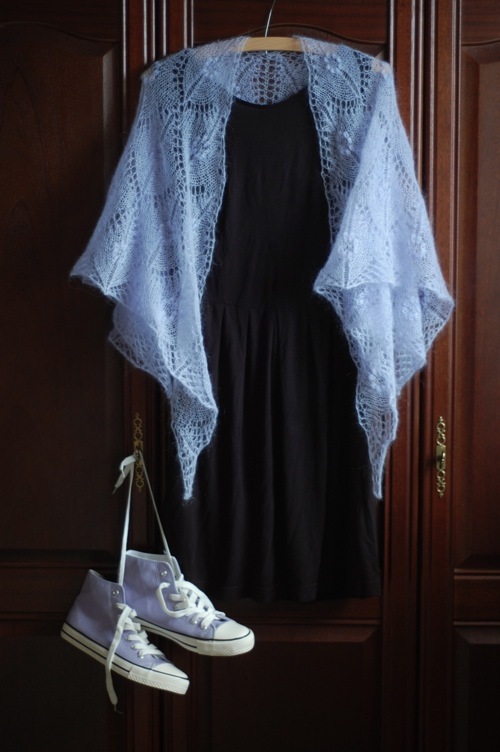 You may notice that the shawl looks quite vibrant against the mint green, whereas the black dress washes it out a little, making it appear nearer grey – more appropriate for evening wear. I hope this gives you a few ideas for styling your shawls. If anyone is interested, I could write more about shawl styling, perhaps with some autumn hues. Let me know in the comments! P.S. My Umbel isn’t looking quite as crisp because it’s been squished in a suitcase. Still not too shabby though, is it? I folded it at the points and laid it flat across the top of the case. 19th September, 2012 // Inspiration // tags: fashion, shawls, styling. 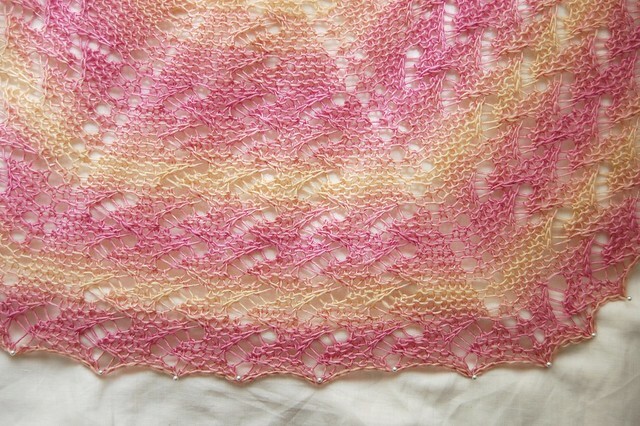 What is ‘Fill-in-the-Blanks Shawl Design’? Well, it’s a method I devised that allows you to create 4 neck-down shawl shapes using a stitch pattern of your choice, without having to chart anything out. In my post on Easy Shawl Borders, I postulated that it would be possible to devise a formula to allow knitters to use 2 sets of stitch markers to fill a shawl with a stitch pattern “on the fly”. As with many things, in practice it took more thinking than I’d anticipated to make a formula that would work for all stitch patterns. I scrapped one version that required a whole page of numbers to be calculated, and then filled in on the instruction sheet. The final worksheets are 1 page each and only require 2 numbers: the first is the number of stitches in one pattern repeat + selvedge stitches, and the second is the number of stitches in one pattern repeat excluding the selvedge stitches. 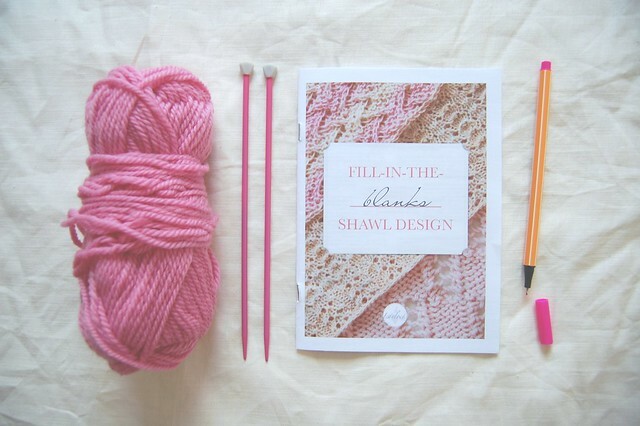 Write those on your worksheet and you’re ready to knit your custom shawl! I tried to make this ebook as comprehensive and awesome as I could, which is partly why it’s been so long coming. To the best of my knowledge, this is a unique resource; there is nothing as simple, mindless or convenient in any other knitting book or ebook. 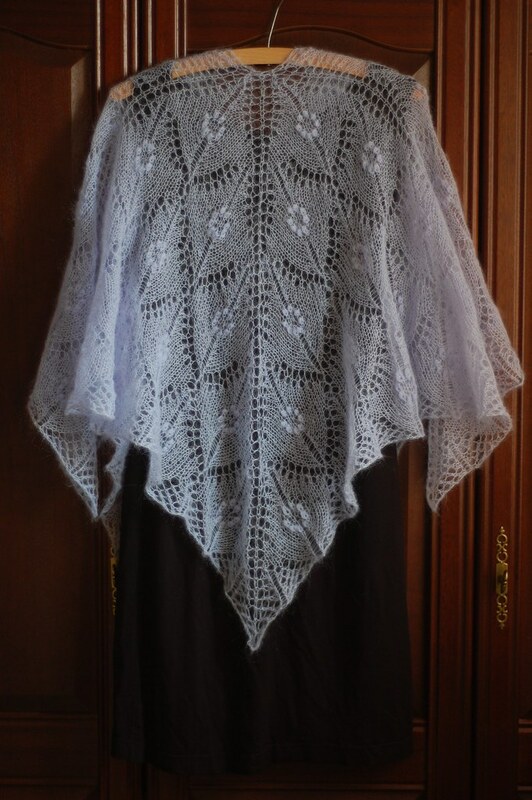 It provides both instant gratification, and a great way to learn about shawl design. 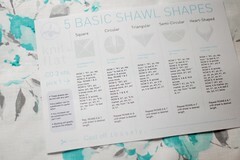 The Shawl Knitting Cheat Sheet has been downloaded over 10,000 times since I released it a little over a year ago! 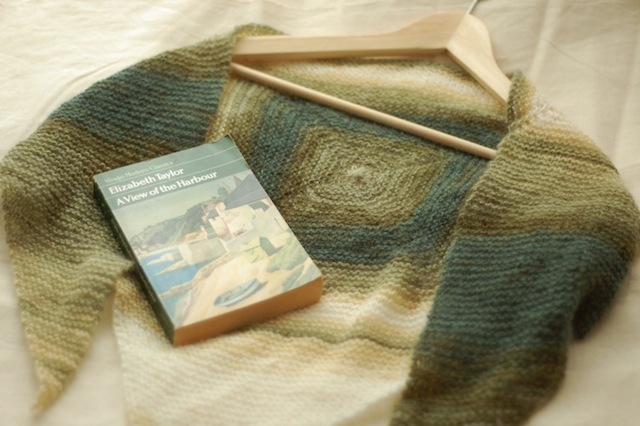 I admit I had no idea it would become so popular, but since then I’ve learnt a lot about the kind of shawl resources that knitters are looking for. That’s a question I’m asked very often, and one I see on knitting forums time and time again. Beginners always jump in at the deep end; it’s understandably difficult to know how much you don’t know, and it’s frustrating to keep being told to backtrack and take things slowly. 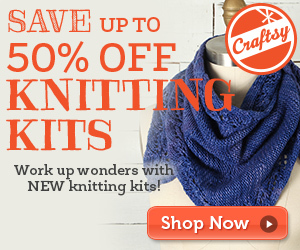 That’s why I’m so excited to finally be able to offer fearless new knitters a solution. Have a look at the list below. Where do you stand? 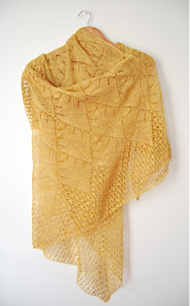 Understand how to knit shawls from patterns. 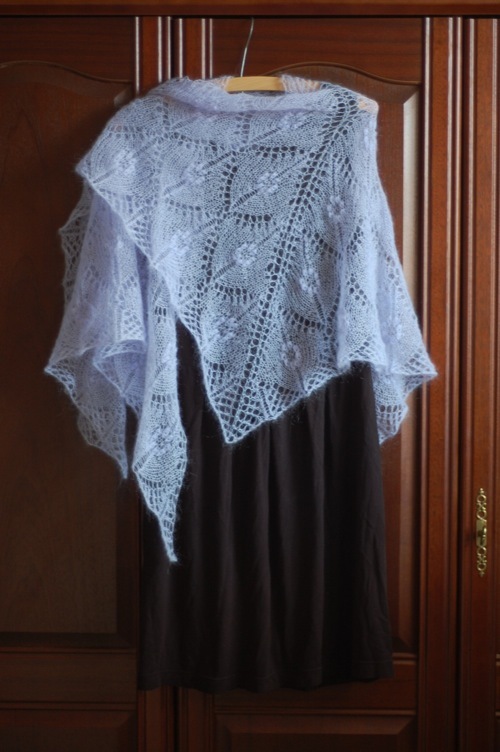 Understand how increases and decreases create shawl shapes. Begin to understand how stitches are manipulated to form stitch patterns. 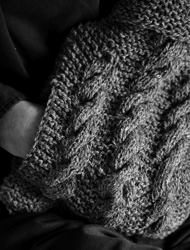 Understand how stitch patterns fit into the shawl shape. 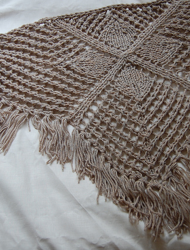 Understand how stitch patterns can be manipulated to fit better into the shawl shape. Understand how stitch patterns flow into each other. Understand how to write out patterns in a way that allows you and others to follow them easily. Understand how to streamline your design process so you can design faster. 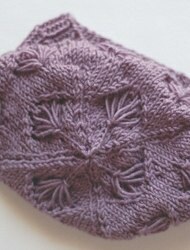 Understand how to alter stitch patterns to better effect. Conduct stitches like a symphony. 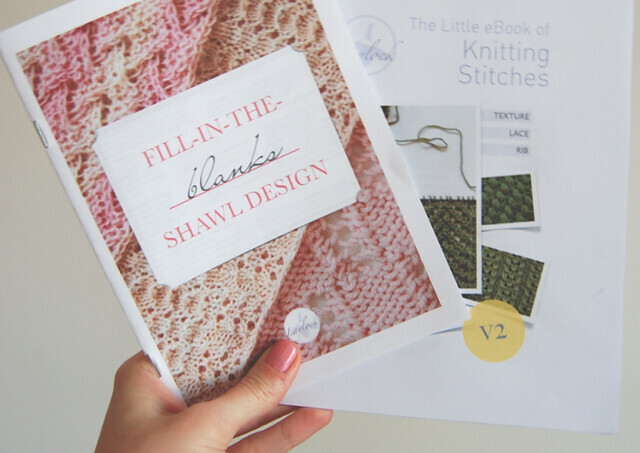 The Free Shawl Cheat Sheet will help you with #2, the Little eBook of Knitting Stitches with #3, and Fill-in-the-Blanks Shawl Design with #4 and #8*. 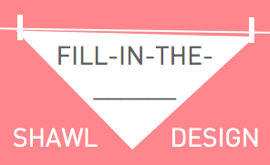 The Blank Shawl Templates included with the latter will help you with #5. Many of these are not levels to be attained, so much as challenges that you are likely to face in different ways in different shawl designs, but it’s still helpful to identify your weaknesses and work on them. 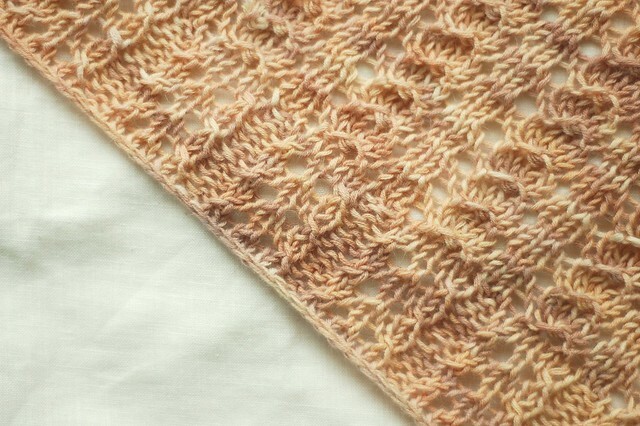 * I used the ebook for a shawl I will be releasing soon, and it made things so much quicker! I was able to simply copy the instructions for the set-up rows, fill in the chart and get knitting. Even just having the blank charts all set out so you don’t have to think about them is a great time-saver, so if you do nothing else, make sure you download them below! photographed on both right & wrong sides. Advice for working shawls with stocking stitch, reverse stocking stitch or garter stitch backgrounds. 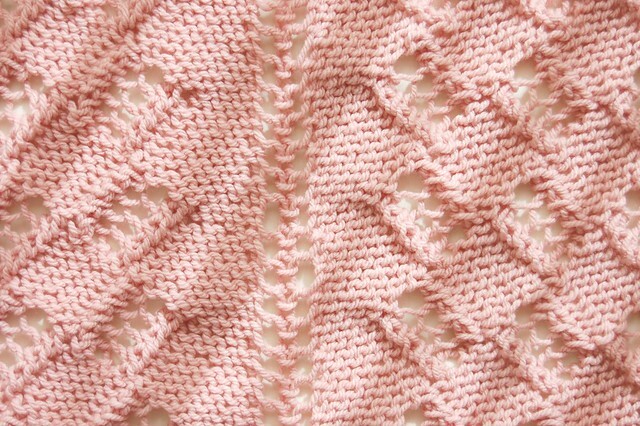 Advice for combining and dividing stitch patterns. 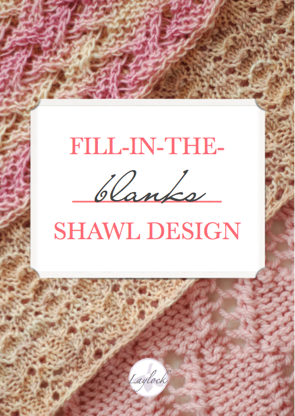 Instructions for creating plain shawls with patterned borders. 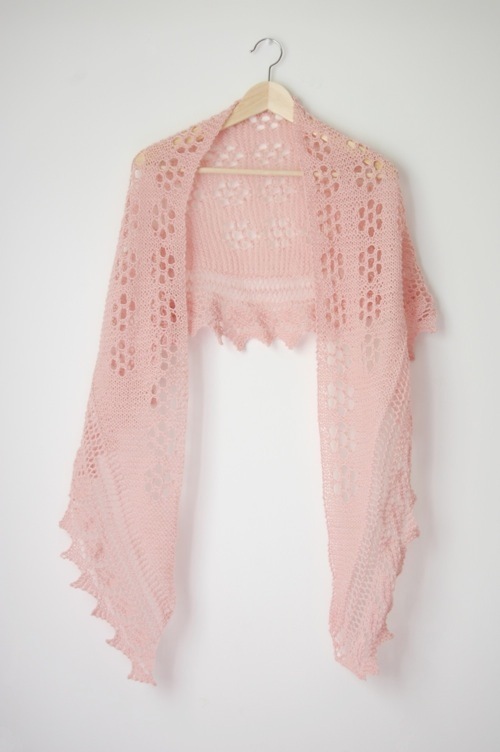 Instructions for working a bottom-up triangular shawl using the stitch pattern of your choice. Blank charts for advanced knitters. Booklet version – if you have good eyesight, you can print 2 pages per sheet and be the proud owner of a super-cute little paperback version. What Will This Ebook Allow You to Do? 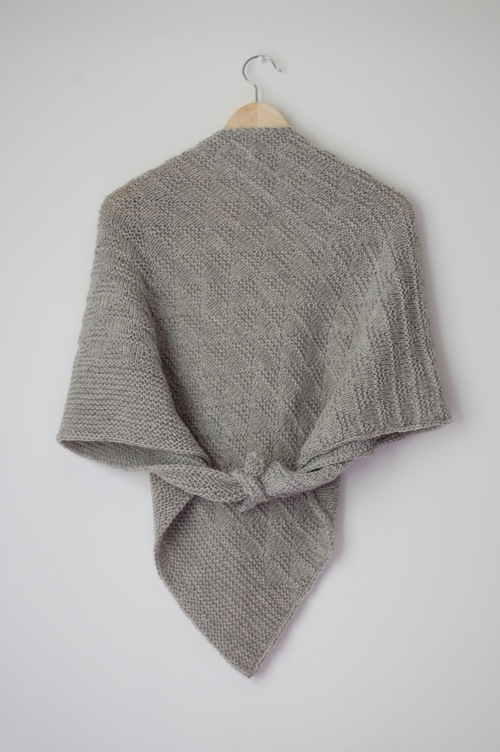 Design your own shawls, in 4 shapes, with your choice of stitch pattern, without the need to chart anything! Mix and match the 4(+1) shawl shapes with the 3 stitch patterns provided to knit up to 15 different shawls + the same number of plain shawls with patterned borders. Make great use of any stitch dictionary you own, to create your own design in minutes. Don’t have a stitch dictionary? 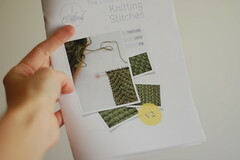 How about a Little eBook of Knitting Stitches? Gain a better understanding of shawl construction and patterning. 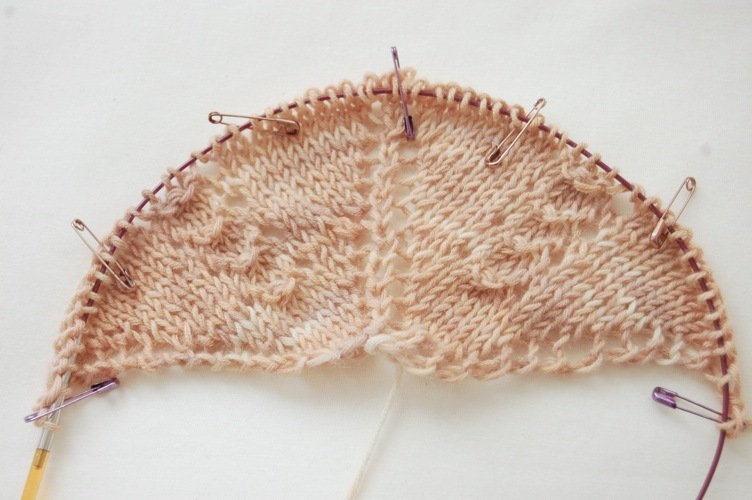 Once you grok the method, it’s also easy to invent (or unvent) your own shawl shapes. Indulge in some mindless design. Once you’ve set up your stitch markers, and understand when to increase, all you need in front of you is your stitch pattern. 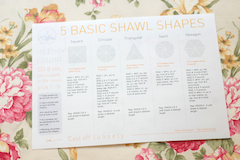 Use charts from top-down shawl patterns you already own to change the shape of a shawl. For example, once you understand the process, you could turn your favourite triangular shawl into a square so that it stays on your shoulders better. Make money! 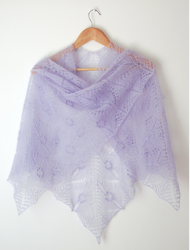 There are many designers who’ve used the Crescent Shawl Shaping Worksheet to create and sell their own designs. With a little practice you can do the same. Download the Stitch Pattern Calculator to your computer, for offline access. Download the blank shawl chart templates as a .zip file (includes MS Excel, and Mac Numbers formats) or view them in Google Docs. PDF versions are included in the ebook. You may also want to download the Aire River Knitting Font to chart out your patterns. 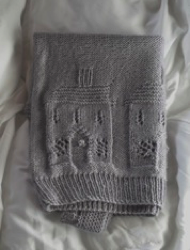 Download some free knitting stitches. You’re very welcome to sell patterns designed using this formula, but please make sure you write everything out properly and do not redistribute the worksheets. You’re also welcome to sell items made using this ebook. I’m considering special pricing for teaching licences, for knitters who would like to use this ebook as the basis for a (paid) knitting course. Send me an email if you’re interested. ETA (9 July): The winners have been announced! Thank you to my wonderful tech editor, Akshata Dhareshwar, for her diligent, meticulous work, for being a lovely person, and for putting up with my slow communication! Thank you to all test knitters. As always I had trouble keeping track, so if you haven’t received a copy of the final ebook, please let me know! 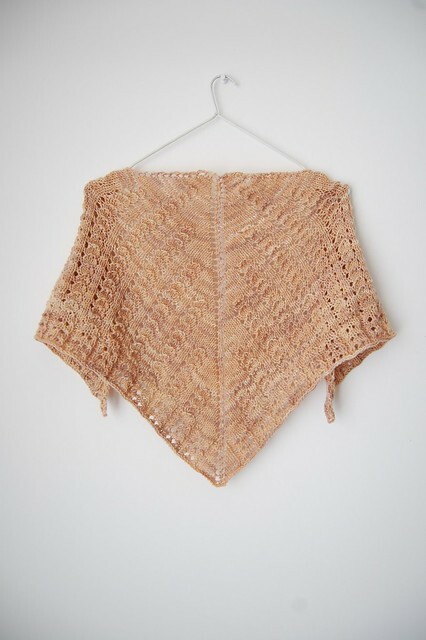 20th June, 2012 // Downloads, Ebooks, Knitwear Design // tags: ebook, shawls.